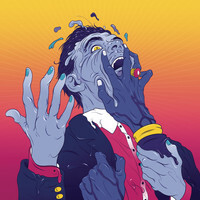 Despite winning an Ivor Novello award for Arc, Everything Everything went back to the drawing board for their third LP, with the aim of producing “an 11-track record that was all killer no filler.” Here, frontman Jonathan Higgs and bassist Jeremy Pritchard explain how Kanye West, terrorism and Madonna’s producer all influenced the visceral art-pop on Get To Heaven. Hi guys, how was Liverpool Sound City? Did the new material go down well? Jonathan Higgs: Really well. I think the whole record is very much geared towards a live environment: it’s high energy and there’s lots of actual playing – guitar solos and stuff like that – which is new territory for us. I think that more expressive feel translates perfectly live, simply because it’s less constrained. Jeremy Pritchard: Which is typically perverse, because we didn’t really write it in that way. We wrote the last few records as a live band, but we didn’t really write that one in that way. Did you purposely approach the creative process differently on Get To Heaven? JH: Yes, we absolutely did. In the studio, we kept using words like “hard” and “fast”, and that coincided with the quite aggressive and violent themes I was writing about at the time. In the past, we’ve dwelled too much on sad songs or grand ballads, and we’d all had enough of it. We wanted to come back and make a much more lively, shorter, punchier album; an 11-track record that was all killer no filler, without any real moments of sensitivity of any kind. Basically, I wanted the record to be an absolute sledgehammer, and put the most horrific we could find on the cover. I had to be talked down a bit. JP: That is the creative process, actually; just us talking Jon down three steps. (Laughs) It’s music that people can enjoy on a purely frivolous, surface-level, but then there’s an awful lot of depth there, should you choose to access it via the lyrics. And you worked with producer Stuart Price, right? JH: We did. We would send him demos via the internet for the vast majority of the time, and while we were asleep he would work on it in LA and then send it back. And then he came over for the last 10 days – all the way from LA to Ancoats – and raced through all the songs, and added about 50% to the record. He was just amazingly adaptable when you think of what he’s done in the past. JP: Yeah, he worked through a lot of songs really, really quickly, because of the incredibly tireless, quick-witted way that he works. And he was so positive and energetic and also curiously devoid of ego. Initially, we did have lots of theoretical reservations about working with (American accent) “the Scissor Sisters guy”, but the way he gave ‘Regret’ – which was the first thing that he sent back to us – a tougher, harder-edged sound, sealed the deal. If you had reservations about working with Price because of some of his previous projects, how did you come to work with him in the first place? JP: He was suggested to us by either our label or management. To be perfectly honest, our initial reaction was, “Well, we’ll meet him, just to play nice.” We’d sent him a load of hard and fast rules about how we wanted to be presented and one of them was that you should be able to picture a band playing in the room at all times, and he did manage that. JH: He’s got his dance music pedigree, and that really comes across in the drums more than anything. On Get To Heaven, it sounds like Mickey [Spearman]’s playing but it also has this quite synthetic feel to it. He did a lot of processing but I don’t think he took the soul away. The record’s got a real rawness and a looseness to it, which is usually the first thing to go when you’re processing with a computer. And he knows everything about programming and synths and tech sounds, so he would just throw something together in five minutes that would take your average DJ guy hours. JP: And then he also has all the normal, British indie kid education as well. I remember on day one, he mentioned off the cuff that the Pixies were his favourite band, and I suddenly thought that we were probably in good hands; he’s got all of that knowledge, and he can call upon any of it. You’ve said previously that Yeezus was a reference point for Get To Heaven. What was it about that record that inspired you? JH: Attitude, I think. Sheer audacity. In terms of the hierarchy of elements that matter in a song, we’re very used to the vocal coming first and then it’s the melody and the chords; Kanye just throws that structure out. And I just love how much he doesn’t care. Halfway through a song he’ll just change to some old sample – in a different key and a different time signature – and then he’ll just say something ridiculously self-aggrandising over the top. Regardless of what you think of Yeezus – because a lot of it is quite ugly to listen to – the fact that he did it, and pulled it off, makes you wish that you could have that confidence. JP: I think it’s amazing for an artist of his commercial position to completely ignore that position, and make a piece of pure art like that. It’s like Bowie. When he did Young Americans it was a really commercially-viable product, and then he just made the opposite, in Low. Lyrically, the imagery is very visceral. You were immersing yourself in TV news at the time, weren’t you? JH: Yeah, I was watching a lot of rolling news while I was writing, simply because we spent that whole year at home, instead of being on the road. It just seemed as though that year brought so many really horrifying events with it, and I got quite worked up about them. Particularly when Alan Henning – who was local to Manchester – was beheaded by Jihadi John. I mean, that just f*cked my head so much, like, “What the hell is going on?” And then there were natural disasters, Ebola, planes going missing, the rise of UKIP... It was just one thing after another; it was insane. And it hasn’t got much better since the election result. I guess a lot of that went into my head. We are just such a violent race, and while I didn’t want to turn a blind eye to it, I couldn’t take it all in. So a lot of the record deals with escapism, or trying to transcend it, but also the idea of getting bogged down and tainted by it, and becoming an extremist. I was trying to inhabit the minds of killers, and people who just snap, and people who believe in something so strongly they’ll do anything to uphold that belief. I wasn’t trying to judge it per se, but trying to inhabit it and understand it. I think the West doesn’t try to understand what’s going on anywhere near enough; they try to compartmentalise it and then swear revenge, instead of looking at why they’re doing it. Do you view Get To Heaven as a political album? JH: It’s definitely political, but I think that political stuff normally tends to have an agenda, and I don’t feel comfortable presenting one, simply because I don’t think it helps anyone for me to do that. Instead, I try to talk about what’s happening, and how that makes me feel, rather than just passing out judgements. Do you think it’s important for musicians to express political opinion? JH: I mean I’ve got opinions and I do express them, but I think it just dates you if you start doing it in song. Songs are for feelings, not the specifics of policy that year. JP: (Laughs) I can’t think of a single band that does write like that, though. JP: But even then, they’ve got this whole 20th century scope to it. Especially on The Holy Bible. Actually, if I had to pick out one record that I would compare Get To Heaven to – in terms of feel and mood – it would probably be The Holy Bible. JH: I mean, I hope that people listening to us talk or sing know what our politics are like. We’re a band for a start. JP: Well, it used to be obvious, like, “We’re artists, so of course we’re not Tories.” But that seems less obvious now. JP: We nearly opened the album with it, literally right up until the moment we mastered it. It was either ‘No Reptiles’ or ‘To The Blade’. JP: If I was going to pick one, I’d pick ‘To The Blade’. It was the last thing we wrote for the album, so it’s probably a bit fresher in our minds. I feel like it’s not ground we’ve covered before. You’ve been together for eight years now. How have your motivations changed since you started out? JH: When we started I wanted us to be the most original band ever, with no moment of any song sounding like anything that’s ever happened before, which was ridiculous. I’ve slowly got more and more relaxed about that, which is only good for the music. Being original without any reason is not enough; I care more about communicating the right feeling. JP: We’re just better at being ourselves now. 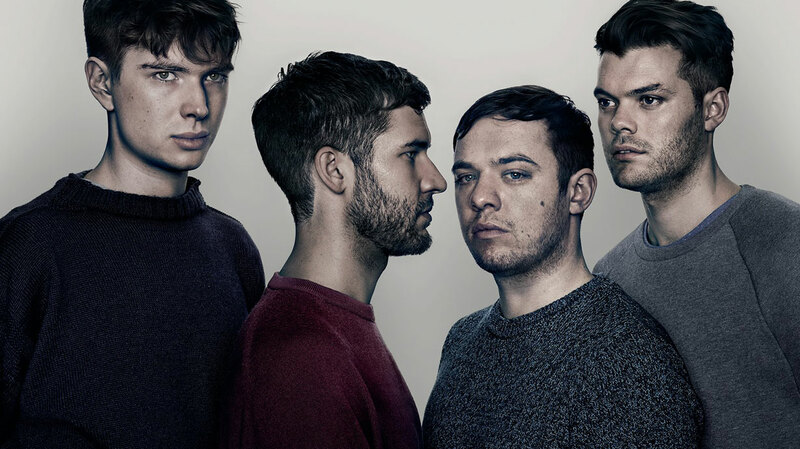 People keep telling us that nobody sounds like Everything Everything, and we’re like, “But there are loads of bits we’ve deliberately ripped off.” (Laughs) Not nicked, but we talk very explicitly about certain songs and certain artists when we’re arranging, and because you aim for something and miss you thereby create something new. All good bands have ever tried to do is emulate their heroes. JH: I definitely think we’ve got a new confidence and belief in what we’re doing as well. We used to worry much more about every facet of what we’re doing, and now I feel like if I think it’s good, then that’s good enough for me. I’m not going to second guess a million people, and if you do you end up making absolute b*llocks. It’s like I was saying about Yeezus: we’ve reached a stage where we don’t care what anyone thinks anymore, and we probably shouldn’t have in the first place. Ultimately, people respect you more if you say that, even if they might not necessarily like what it is you’re saying.